We can avail to our clients this exclusive range Hydraulic Dock Leveler. The offered range is an ideal leveler for being used wherever there is a difference in the level where the goods are stored and the level where they are to be transported. 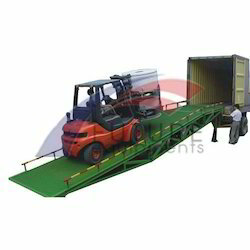 Acting as efficient bridges, these enable in easy, quick and economical flow of work. The range has an efficient high load bearing capacity and are available in various customized models to suit the specific needs of our clients.